The ever dexterous Ian Watson has unleashed his latest creation here at hXe under his ‘Swefn’ moniker. Five tracks of exquisite electronics deftly balance the tensions of life. Ian’s challenging home-made electronics are pushed to new heights as duplicitous worlds invade a cosmos of uncertainty and rattle the speaker cones with uncertainty as the ultimate destination. Totally ace stuff and highly recommended listening! 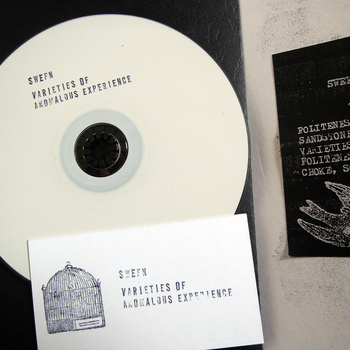 Available as a high quality download or in physical format as a hand-stamped white cdr with some typically “hXe” handmade packaging: stamps , photocopies , typewriters, abstract silver ink creations adorn the sounds.